If you want to make the classic kebab healthier, then do it at home! Meat, vegetables, sauce and then everything wrapped in thin lavash bread. Grill and eat. Why do Russians like shaurma so much? In Turkey they call it döner kebab, in Greece - gyro, and in Armenia – ġarsi khorovats (shaslyk a-la Kars). Having so many names, shaurma has become one of the most popular and recognizable Middle Eastern fast foods around the world, especially in Russia. After the collapse of the Soviet Union, Russian streets began to fill with kiosks selling foreign fast food, and in the mid-90s came the moment of triumph for the shaurma, which was and still is ubiquitous on city streets. Those chaotic times were reflected in shaurma’s chaotic nature – different ingredients mixed in, and nobody knew exactly what was inside, except the cook who ruled over the process. Shaurma strikes a crushing blow to logical thinking – it has no firm recipe, nor list of ingredients, and its filling depends not only of the place of cooking, but also depending on the creator’s wild fantasy. In some Russian regions, the serving of this quick meal is indeed wild. Difference between shaurma and shaverma? Not surprisingly, Moscow and St. Petersburg disagree on how to call this dish. Muscovites usually call it shaurma, but you won’t find it in Russia’s northern capital where the streets are full of places selling, shaverma. Also, shaurma is cooked with kuritsa (chicken), while shaverma is cooked with kura, which is what St. Petersburg locals call chicken. In Moscow, the shaurma maker (they call him shaurman) is quite generous with sliced white cabbage, but in some place they add fried potatoes. In St. Petersburg, people consider this a sacrilege, and shaverma is made with only sliced tomatoes, cucumbers, a few salad leaves, onion and sauce (a mix of ketchup and mayo). Sometimes, it can be filled with spicy Korean carrot salad. The main difference between a Russian shaurma and those made in the Middle East is the meat. In Russia, you can fill it not only with lamb and chicken, but also with pork, which of course is taboo for most of the Middle East. We all know that most street meals are not so healthy, but it’s often hard to refuse a quick bite of tasty fast food. 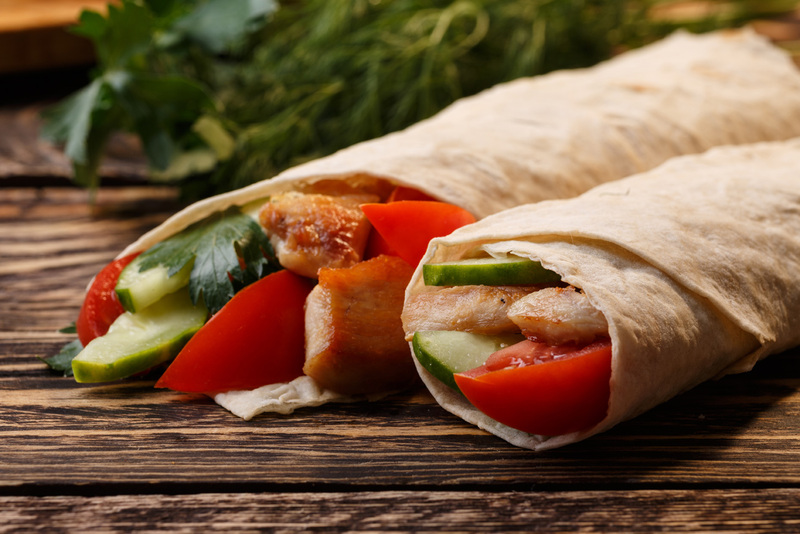 However, if you cook shaurma from fresh quality ingredients, then it can be the perfect lunch even for those on a diet. 1. Slice the vegetables and put aside – let them wait for the final moment. Grill the meat. You can marinade it in kefir, soya sauce or lemon. Your chicken will be more tender and softer. 2. For the sauce, mix the sliced herbs with sour cream. Our secret ingredient is kefir – you need just a couple of tablespoons. Squeeze 1-2 cloves of garlic. Salt if needed. 3. Now, gather them all together. Take pita or lavash and add the onion, tomatoes, cucumbers and sliced chicken, and of course sauce. Roll and grill for 30 seconds. 4. Wrap in foil (because it’s very hot), top with sauce and share with friends. What’s your favorite shaurma recipe? Share in the comments section below!